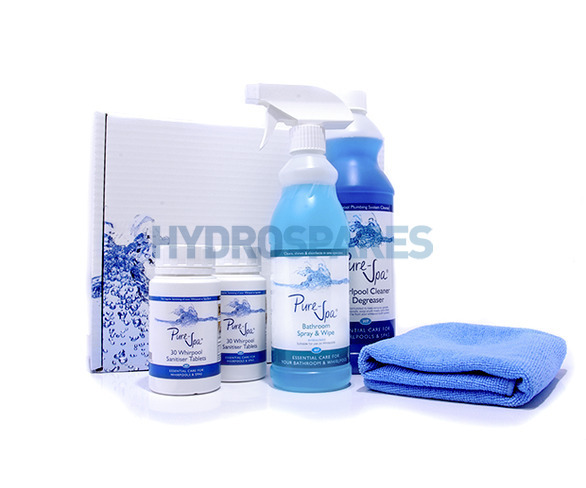 Everything you need to help clean & maintain your whirlpool or Spa bath! Pure-Spa Whirlpool cleaner is specially formulated to help remove the build up of grease, body oil deposits, soap scum marks & general grime from your whirlpool system pipework & pump. Acid Free, Non Hazardous, User friendly, Fully Biodegradable, Septic tank freindly,Safe to use on Chrome, Brass, Gold Plated. Stainless Steel, Ceramics, Tiles, PVC & Plastics. For a fresher more Hygienic system. Use as part of a regular whirlpool cleaning and sanitising regime.